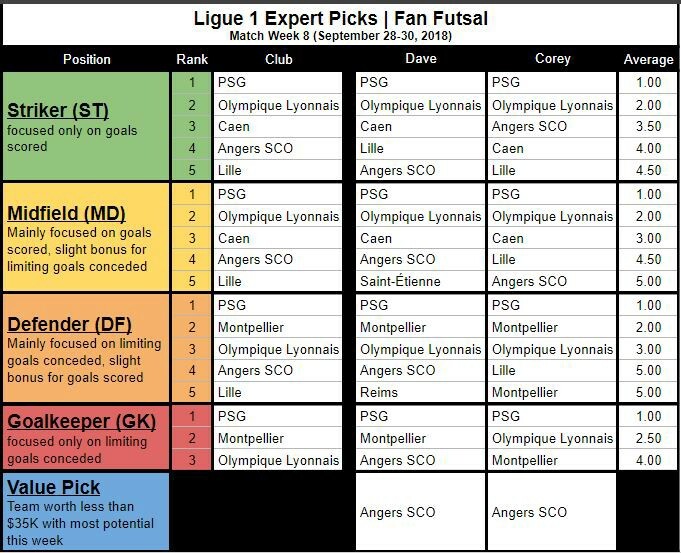 Each week our Fan Futsal Experts (Dave & Corey) rank the Ligue 1 clubs by their expected performance at each position. Below is the table with their picks, average ranking, and a value pick from each expert of a club under $35K you should target in your Fan Futsal lineups this week. 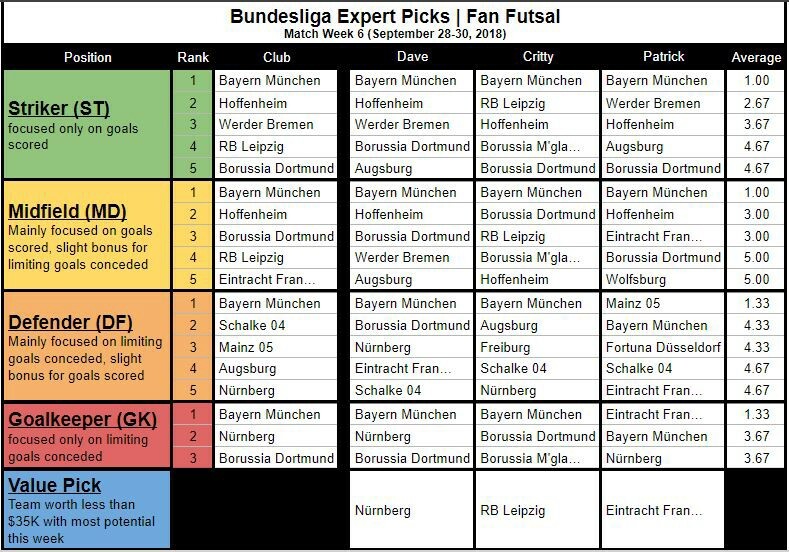 Each week our Fan Futsal Experts (Dave, Critty, & Patrick) rank the Bundesliga clubs by their expected performance at each position. Below is the table with their picks, average ranking, and a value pick from each expert of a club under $35K you should target in your Fan Futsal lineups this week. 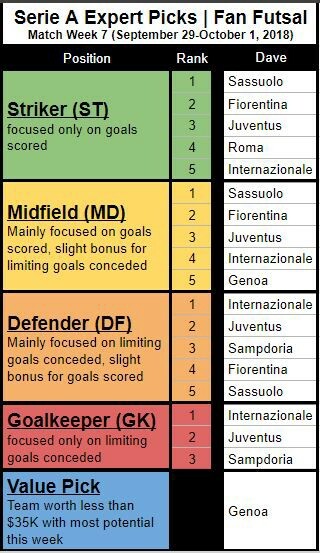 Each week our Fan Futsal Experts (just Dave this week) rank the Serie A clubs by their expected performance at each position. Below is the table with their picks, average ranking, and a value pick from each expert of a club under $35K you should target in your Fan Futsal lineups this week. 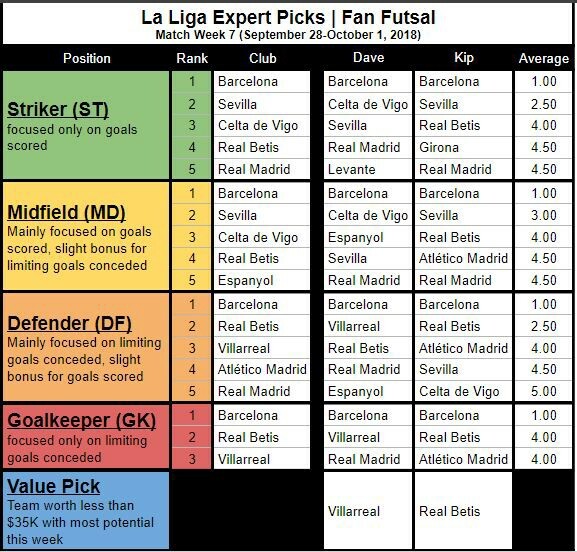 Each week our Fan Futsal Experts (Dave & Kip) rank the La Liga clubs by their expected performance at each position. Below is the table with their picks, average ranking, and a value pick from each expert of a club under $35K you should target in your Fan Futsal lineups this week. Each week our Fan Futsal Experts (Dave, Andrew, & Alex) rank the Premier League clubs by their expected performance at each position. Below is the table with their picks, average ranking, and a value pick from each expert of a club under $35K you should target in your Fan Futsal lineups this week.